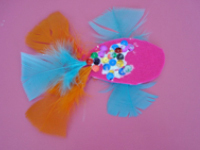 A colourful little fish that children can wear or attach to various objects (or people) on April Fools' Day. 1. Gather your material. 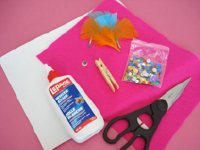 You will need felt, Fun Foam, white glue, a wiggly eye, scissors, sequins, feathers, and a clothespin. 2. 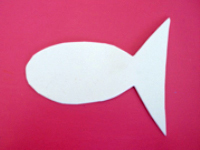 Cut a fish shape out of a sheet of Fun Foam. 3. 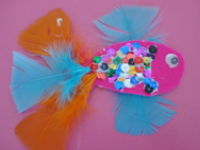 Trace the Fun Foam fish on a piece of felt and cut it out. 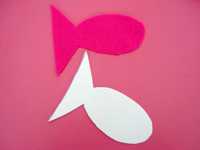 Glue the felt fish on the Fun Foam fish. 4. 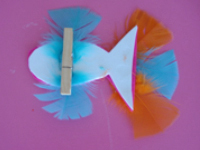 Glue two feathers on the fish to represent its fins (one on top and one on the bottom). 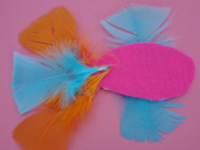 Glue a few additional feathers on its tail. 5. 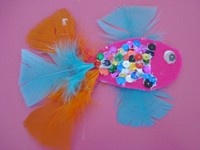 Apply white glue on one section of your fish, near its tail, and press sequins on it to represent scales. 6. Add a wiggly eye. 8. 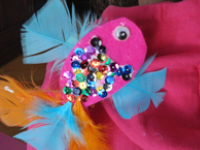 Invite children to wear their little fish...before surprising someone on April 1st!